Bryon Powell of iRunFar finished the 2015 Hardrock 100 in 31:30. In the following interview, Bryon talks about what went right in his training and race, what shoes he ran in, what advice he’d give to a first-time Hardrock runner, what were the highs of his race, and how Hardrock is different from other 100s. Mario Pagliacci: One moment, please. Mauri Pagliacci of iRunFar here with Bryon Powell, a recent finisher of the Hardrock 100. Congratulations, Bryon. Bryon Powell: Thank you, Mauri. iRunFar (Pagliacci): That was pretty well run, right? Powell: Yeah, I think so. iRunFar: A couple of hours around the mountains—how do you feel? Powell: It’s two days after the finish, so I feel pretty good. iRunFar: Alright. You’ve been actually running around the town, like from the bar to Cafe Mobius and to your house. You’re moving pretty well. Powell: Yeah, amazingly, I think I prepared myself, my muscles, that I didn’t feel any of the descents until the final descent, 32,000 feet of descending into the race. Muscularly, even during the race or right after the race, I could pick my feet up to change shoes or do whatever. That went well. iRunFar: You killed all the myths about the road-running shoe in a trail, technical 100 miler. How did it work out for you? You’ve been training hard, working a lot, you’ve been traveling here and there and how do you manage like a regular, normal person and now this long day? iRunFar: I think that was not for the work. Powell: It’s because I didn’t do what I wanted to for personal preparation. In other races like Western States two years ago, it was little things like having some music I wanted to listen to on my i-pod, or some podcasts. It seems silly, but it’s something I didn’t make the time for two years ago, and it was partly just putting a foot on the ground or drawing the line saying, I’m going to make the time for myself. It did cut into my sleep, but I also went to bed at midnight and didn’t fall asleep until 2:30 a.m. because I was thinking about work and my crew and running. Probably something I should have done earlier, and something I will do next time I run a focus race, whatever distance that is, is really visualize the race a lot more. I hadn’t done that. I had been looking at times for a conservative pace around the mountains, but I hadn’t really visualized what that would look like, what my nutrition would look like, how my effort would be. It’s not hokey, that’s just what popped in my mind, and I think that was useful. iRunFar: Usually, you have a plan of what to eat and where to change socks—because you didn’t change shoes? Powell: I had an idea on food. I started out on Saturday with two huge duffel bags and was just going to go to the aid stations and grab what I wanted. Saturday night after I packed everything, or as I was packing everything, Oh, I’m just going to make one little plastic baggie for each aid station, and have the other stuff if I want it, but basically have my crew hand me this bag to go through all the food that I want and a pair of socks or a long-sleeved shirt for going into the night in Ouray or Grouse Gulch if it got dark early. iRunFar: I heard Joe Grant, your pacer, talking about how focused you were on the downhills and how you managed to remember where you put your things 80 miles in the race, where you put your things like Buff here, gel here. How do you concentrate for that? It’s super hard. Powell: I’ve never had that before. That was an amazing gift. First, I had those two hours of sleep and in the middle of the night (of the race), I never had a time where I felt tired in the slightest. I never had a time where my concentration waned or was lower. I don’t know if I… people say they’re in the zone of flow… it’s usually discussing some incredible performance or something where everything is going right. Those last 40 miles, it wasn’t all going right, but the focus was there. Not once during the race did I have a doubt that I would finish. That’s not normal for a 100, even when I’ve done good 100’s, there are times where you go, “Oh, this is tough. I don’t know if I’m going to make it.” It crosses your mind and then you stop thinking about it quickly. It didn’t even come into my mind which was really cool. iRunFar: Do you think that was because you had a super dream about this race? Powell: I think it’s because I committed to it for a long time, basically since I got in. I wasn’t training hard, and I really didn’t get into training until February or March, but I was thinking about it. It was something I really wanted to accomplishment. My goal through training wasn’t to run, wasn’t to train myself to run my fastest possible Hardrock. My goal was to train myself to have the best chances of finishing. Powell: I did. I bonked for 40 miles. But no, to make sure my quads were good. I’ve had chronic lower-leg issues since 2002, 13 years now. It’s tight calves, Achilles, plantar fasciitis; it comes and goes. But strengthening in February and March—I was doing rehab. I think in making those investments, It’s like putting deposits in the bank. The money was rolling out that day. Powell: I could not have asked for better focus. I was focused. At mile 40 in the race, you were with me and pacing me then, I was going up Camp Bird Road above Governors and it got cold and I don’t think I was eating enough. I had just picked up my poles for that section and got really low. iRunFar: I was not with you. Vince [Heyd] was with you. iRunFar: You were great on the downhill probably. Powell: I wasn’t flying because I couldn’t get my heart rate that high up, but I could run and be nimble and not fall down. Powell: I had slips. I never… going into the race with these New Balance 1400’s, they’re road racers. They have no traction at all. They’re not supposed to. About eight or nine days before the race, I went out with Meghan [Hicks]. All through training I’d worn heavier shoes than normal because I normally run in these shoes. I’d worn heavier lugged shoes and really trained specifically to get used to running in those couple extra ounces. I got back from Western States and the snow had melted even more than we’d expected. I’m like, Alright, we’re going up from the start to KT aid station/Putnam and back. I’m going to throw on the 1400’s and see what it was. We encountered what was one of the wettest stretches on the course with really slick vegetation and three times I kind of slipped out. I kind of knew that was the worst it was going to get. I was like, I’m going to start the race and go to Cunningham to test. It’s 9.2 miles and I know the Cunningham descent well enough that I’m not really risking a lot, but I’ll know if this is not going to work. It would have taken a minute—my feet would have been great—to just change the shoes. It was worth risking. I did fall five or six times: two sections—boom, boom, boom—total slide-outs. It never knocked the wind out of me. It never hurt anything. It was like slide-tackling in soccer or something or sliding into a base in baseball. iRunFar: Just glassy slide. What would you say to a person who is training for Hardrock, or not training because you have to get in, but who has a dream for Hardrock, like the guy who finished last in 47:59:59—to that kind of person, to those guys who just come to enjoy the mountains? What is the best of Hardrock? Powell: The best or Hardrock? Everything. iRunFar: Everything, I know, but in all its bests? Powell: I was conscious of that before the race. I was going to say I was physically fit enough to do the race, but am I mentally ready? The mentally ready part I didn’t have two years ago at Western States. I just wasn’t mentally in the right place. iRunFar: Yeah, you have to be focused with this. Powell: That’s true with any 100, I think. I guess there are some people who do a ton and just kind of run through them and have the experience, okay, maybe not. If it’s something you don’t do more than twice a year, you really have to just want deep down inside to do it. iRunFar: You can go through 100 milers, to many 100 milers and go through them and just go through pain or whatever, but in Hardrock, it’s not the same. I’ve been watching faces since Kilian [Jornet] to the last guy. It’s different. You need to have something different to be a Hardrocker. Powell: I’m not spiritual or anything or New Age-y, but it has to be something in your being, in your soul, or something deep down there that it means a ton to you. I love that having a purpose. It gave me purpose beforehand. Having the purpose beforehand gave me purpose during the race. It carried forward. iRunFar: How do you feel having shared the race with Meghan? You haven’t done that a lot? Powell: We go to a lot of races we run casually together. iRunFar: This one was a big deal. Powell: One we were focusing on, yeah. The last time we did that was Marathon des Sables in 2009. It’s actually just shortly after we started dating and were living across the country. It was sort of a test run for us kind of. I actually decided to quit my job and sell my house on the plane ride back. That’s beside the point. iRunFar: It was a huge change. Powell: Being here with her training and having that same goal was special. It was hard being on the course not knowing where she was, but I was never doubting that she would get around. We really wanted each other to have the best possible race. That’s not going to happen at Hardrock, but that’s what you want. Neither of us did, but I think we both had races that we were proud of. That meant a lot. I know Meghan was a little bit sad that she wasn’t going to see me finish my first Hardrock because it is so monumental. I’m okay with it. iRunFar: It doesn’t matter, actually. Powell: It was awesome to be here to see her finish. We were actually over to grab dinner because we thought we had a long ways to go. We got a text. We actually probably could have made everything work, we just ditched dinner… a friend picked it up. Thank you, Mike Place. We just ran over here basically. Powell: Actually, I caught a ride. iRunFar: I have a question from a follower. His name is Alex Varner. He’s been asking what your favorite Taylor Swift song was during Hardrock. Powell: During the race? I didn’t listen to a single song during the race. iRunFar: Oh, no. He’ll be so disappointed about it. Powell: Probably Rob Krar more than him. I listened to some podcasts. It was funny as I was really enjoying being in the environment, but a couple podcasts early on… I found in training that I could put a podcast on and they would help me stay smooth and stay calm. Sometimes you put on music and you get pumped up. I didn’t want to. It was more… not a depressive thing, but an even thing. I kind of like to listen to Freakonomics or Market Place Money and just taking a different look at life basically. I find them meditative and entertaining and not exciting. iRunFar: Yeah, I listen to this Metallica song to go faster. iRunFar: It’s okay. At least you took the time to enjoy it. When you stop to take pictures, you’re actually enjoying the landscape. Powell: That’s what I wanted to do. I wanted to focus on my fun. I wanted to finish, and I wanted to focus on fun. I had a smile, pretty much a smile, on my face the whole way. I remember seeing… I might not have been talking, but coming up out of the KT aid station, there’s a little dip and then you climb 700-800 feet up a pretty steep forested area. Dave James and Amy [Scheer English] were reporting for iRunFar higher up and came running down in a thunderstorm. They had seen Joe and were saying high to Joe Grant, my pacer at the time. They didn’t quite recognize me at first and they said something. I was like, thumbs up. I’m going 125 beats/minute. For me, this is like slow walking if I was fresh in town. I couldn’t… I wasn’t going to talk. I wasn’t talking to Joe. When we were going down, yeah, chatter away when the effort is a little less. iRunFar: How was the crew? I’ve been seeing through reporting the crew for Kilian and [Anna] Frost and it’s super rushed and they all go fast and try to keep them up. How’s the crews for a regular person, for an over-24 hours person or over-30 hours? Powell: Hardrock is different. There’s a ton of other people around, both aid station and other crew. It’s so spread out that other people help out. My sister, Gretchen [Kish], she was my crew. She helped crew my first Western States and then at Wasatch and Leadville. It’s been awhile. It’s been since 2009 that she last crewed me. She had enough knowledge to get by. I did simplify things before the race. There was a big bag for each aid station. Dig it out, and I take it. Give me a full bottle. It was pretty easy and quick. I look forward to seeing the final statistics on what the aid station time I had was. Even when things got rough, I’m sure I’d be surprised if I’m not well under an hour total aid station time. Even Ouray was the first time I sat all race. I went and used the toilet. I sat down and changed my socks there. I kept the same shoes. They were wet, but I had a long road climb, and they felt great. I changed my water bottle and got night time clothes out. I had 600 calories of Boggs Trail Butter—packet open. I had a little water, swapped out food, and was on my way in five minutes. I did everything. It never felt rushed. I just do it. Powell: I think efficiency… I think people can take too much time at aid stations. It’s so easy. I’ve probably done it in the past. Yeah, it’s an easy way to… even if you’re not racing. I don’t feel like I was racing out there in a competing kind of sense. You’re just giving up time for free. I appreciated the original quote, it might come from David Horton or it might come from before him, but that’s kind of where I got it from—“relentless forward progress”—it’s true. I never gave up time without a purpose out there. I’m very happy about that. There were times at mile 20 when my legs and quads were feeling a little tired because there’s a lot of running in Pole Creek. I got to a deeper-water crossing and just sat down for 20 seconds in the stream. I got up and I felt great. I did that at the last water crossing with two-and-a-half miles to go. My first time I could feel my quads at all was on that last descent. I got to the water crossing and it felt good. I ducked down and got my legs submerged and I could run the rest of the way in. It was really hard, and I don’t know if Joe Grant would ever share, but there was a lot of stopping, a lot of stopping and sitting on the big climbs late in the race. I’d make as far of an effort as I could walking and then I’d stop and say, “Joe, 30 seconds.” I’d stop and sit for 30 seconds and my heart rate would go down. I’d get up usually five seconds before he’d… I wouldn’t count it, but I’d just get up and go when my heart rate was back under control and I felt I could make another steady push. It just felt like if I were to try to keep my heart rate lower, it would just be such an inefficient… when I could walk. My muscles were great. iRunFar: What would be your main tips for a person who is coming for their first time for Hardrock? Powell: Be psyched for it. Keep a positive attitude. Keep moving forward. Keep moving forward. I had a great time through… I wasn’t concentrating on it, but I was really fast through Ouray and through Governors. The last 40 or so miles, the tank was empty and I ran 31:30… trudging along uphill, but I kept moving. If I would have a video of that to look back, I don’t even need that, it was slow. I was apologizing. Darn. Just keep moving. Do you have to sit in an aid station and eat soup and a grilled cheese and whatever? No. Get a grilled cheese and get a cup of soup and walk down the course. Chances are if you’re in an aid station, you’ve got to go up from there. Just walk and eat. Take care of your problems, but… Having fun is such a key—keeping it light, keeping it happy. I was very specific with the people who were pacing me and crewing me that I wanted to just enjoy it and to focus on the positives. It’s the exact opposite of what happened in 2013 at Western States. Powell: I think it’s the mental state leading the physical state rather than the other way around. It’s easier to keep it when things are going well, but just keeping it positive. That’s why I had the music. I had a super bonky training run here a month ago and had a couple gels and threw on some music and sort of started singing along and pumping my fist and not quite dancing but just getting into it. It just turned my attitude around. You can go into it with a good attitude and can turn it around. I kept it as positive as I’ve ever done in a race, but dark things creep into your mind. You’re human. iRunFar: Of course. It happens to everyone. Powell: They’re just crappy thoughts that cross my mind. I found myself dwelling on them for 15 seconds, 30 seconds, a minute, 90 seconds. I’m like, No, I cannot go there. It was crappy life stuff. It wasn’t physical stuff, but I’m sure it would work the same for physical. Okay, your blisters hurt or your quads hurt and it might affect how you can run, but don’t let it mean you can’t finish or keep moving forward or whatever. That was a key takeaway. Just move forward and be happy. Trust me, there’s stuff I need to figure out. There are lessons that I learned. I probably shouldn’t share those. iRunFar: At some point in a couple of weeks you’ll remember those. Powell: I’ve realized that I should have been eating… I was eating 300 or 400 calories/hour of sugar-based foods early on and it worked great for so long. It was good. I would have mixed in a little more real food early and I would have really forced myself to eat more real food later when I couldn’t tolerate it. It’s fine. I wasn’t puking, but I wasn’t getting it done. I could have done one per hour like forced myself to eat a Snickers bar or a Gu or an Untapped Maple Syrup. I loved the flavor, I just didn’t want to eat anything else for another half hour. It wasn’t the taste. I could tolerate everything. Carrying a rain jacket—I was stupid for not carrying a rain jacket. iRunFar: You didn’t carry one? Powell: No, I kept… it was never super stormy, but I had a wind shell the whole race and it was just enough, but I wouldn’t want to push that barrier again. Places where I thought I needed one pair of gloves, I would have brought two. I had a pair of thin running gloves. I would have brought a second thin pair of running gloves just to throw on if I needed it. I would have had a pair of super light rain pants, but I didn’t. Yeah, don’t mess with that. Powell: Yeah. Things came and went fast enough that I was okay. iRunFar: If anything happens, you would have been in a complicated situation. Powell: Yeah, you could work your way out of it, but I’d rather invest in a few extra ounces to keep safe there. Same with just… I didn’t use poles in training. I used them three times for a total of 9,000 or 10,000 feet of climbing. I paced them through the race to make sure I didn’t get too sore, and that was never an issue, but I stopped eating as much and I stopped drinking as much and it was just that I’m not used to it. The same thing with I don’t like to run with packs a lot because I run short enough that I’m comfortable running two, three, or four hours on a nice day without more than a little hand held bottle or nothing. So I just wasn’t very efficient with the poles or the pack. I’d used them enough in the last couple weeks to get stuff out of the front. I knew where I was carrying my water bottle, phone, and gels. My extra stuff (food) was here, and I just couldn’t efficiently get to it. Just taking it on and off to get to a jacket… I just figured out that if it was on and off again, I just tied it around my waist. I didn’t even think of that until right now. Dumb. That would have worked. iRunFar: You’re kind of brain dead at that moment. Powell: I don’t regret that, but use your gear. Dial it in. I was even thinking pretty close to the race that I was going to use a water bottle pack most of the race. But I’m glad I trained with a pack… I used the Ultimate Direction Scott Jurek vest, and I trained with it mainly because I wanted to carry weight and carry more gear than I was going to in the race to feel strong enough. 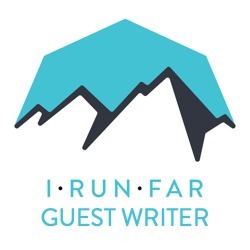 iRunFar: On all this, let’s call it “newbie mistakes,” or whatever, taking the bottles and not being trained with it, did it bring any soreness or different soreness? Powell: Nothing bad. A couple times I got little hot spots on my hands, but there were never blisters. I could sort of change them around. I never really… my left shoulder is a little more sore than normal, but nothing, nothing horrible. It wasn’t anything like that. iRunFar: At the finish line, you enjoyed it and it was super cool. Then AJW brought all this bar and he had champagne in the street and you could go to jail because of that because you were drinking in the street. Hey, Policeman. But you’ve got to tell us about your friend. Powell: My friend, Christophe Rochette, a French trail journalist passed away in June not long after I’d stopped drinking. He was a real jovial fellow that liked a good drink and I just remember… he coordinated the media and the international elite teams at Les Templiers last year. I just remember having champagne with him after the race. He was kind of joking around taking a sip off the bottle… we had plastic glasses… a big party at the finish line. I would have had a toast to him the day I found out. That really bad run I had here in training, I found out that morning after I woke up that he’d passed away the day before. I would have had a toast to him right away, but I just sort of carried that along. That was a goal. I wasn’t going to drink until I kissed the Hardrock, so I couldn’t toast Christophe until I finished. In trying to keep things positive, I’d never tried this before and I don’t know if I’ll do it again, but from each aid station to each aid station, I sort of broke down and printed out a list to bring with me one theme to think about (the flowers, the meadows, the ridges, or being high, or whatever) and one person. He was the penultimate section. The last section was me. I definitely carried him in my mind during the day. iRunFar: I pretty much don’t have any more questions. Congratulations, again. I hope to see you again here next year at some point or pacing me probably. Powell: You’d better get your qualifier. iRunFar: I will get one at some point. Powell: The Bear or Pine to Palm? iRunFar: I’m going to do something. Powell: You will see my name in this lottery next year and probably until I get in again. I’m not a “Hardrocker” yet. iRunFar: Yeah, you’re not a “Hardrocker” yet after this weekend. Powell: I want to see the course in the other direction. I tried to train for this one noncompetitively and to finish—that was the goal. I knew things I could probably try to run faster, train a whole lot more running. In the other direction, there’s even more running in that direction. I’d be excited. That probably suits me better—real steep climbs and long descents. iRunFar: Coming down from Kroger’s should be great. Powell: I said before the race, 30-hour fitness, 33-hour pace, and I ran it out 31:30. I’m pretty sure… I think I’ll say I’d like to be under 30 hours the next time I’m here. I think I can. iRunFar: It was close. It was super close. Powell: Ehhh… I felt like it was within reach even fairly late in the race. I’ll be back. AJW is SO hilarious, love it! Awesome to watch the video of the finish, so cool to see the ultra community's favorite guy conquer the HRH! Did you hear that New Balance? The "BP" trail – a 1400 plus stone guard – would SELL OUT! But you have to call it the "BP" or the "RunFar"